This article was originally published by bit-tech on 31st December 2001. 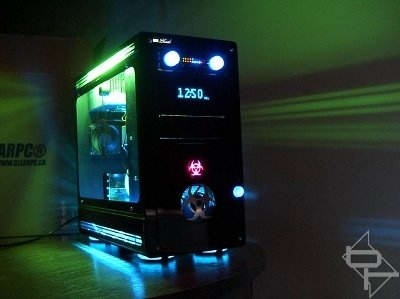 At the time, case modding was in its infancy - a time when many people were only just learning about window modding and cutting blowholes. As you will see over the following pages, the skill and attention to detail exhibited by Dave "Macroman" Williams is impressive even by today's high standards, and Macro Black was a case mod truly ahead of its time. Don your safety goggles as we go Back To The Future to witness the birth of Macro Black. After seeing Koolvin's Project Crystal, I started thinking "how about taking the same clear case and doing something completely different just for fun?". "Go for it!" said the Modfather, so I did and "Macro Black" was born. This entire project started out purely as an exercise in modding, but resulted in a case I fell in love with and decided to keep for myself. This first part of the article deals with just showing the case mods without going into any detail of how things were done with the techniques to follow. I decided to present it this way because most of the parts used in this project have been custom made and it would take forever to go into detail on everything all in one go. So the first four pages are just an overview and since the guides, how-to's etc. are under construction, if there is anything you want me to cover in detail, questions etc. then post them in the forum here rather than e-mail me, and I will collate and answer them in the guides as I write them. After previous experience in painting Acrylic I decided to paint the case and chose black and chrome as the colour scheme. I picked the biohazard theme simply because I like the symbol. 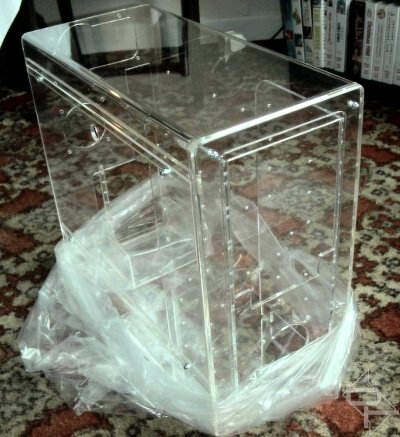 Previously I had only seen pictures of the Clear PC and had never really appreciated the quality of this case. Photographs really do not show the beauty and quality of this case and it has to be seen to be believed. Here is how the virgin case looked straight out of the box, before I started any work.